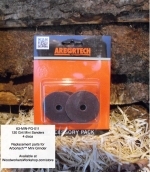 For use with your Arbortech™ mini grinder, this package contains four discs of120 grit 2 inch (50 mm) diameter heavy duty abrasive pads. The pads screw directly onto the mini grinder extension arm (screw is included). This accessory tool is used with the Arbortech™ product line of power carving woodworking tools. The package contains 3 spacers to allow you to adjust the height of the TURBOPlane™ 16-22 mm. Rapid removal of wood material with the ease of free hand styling. Tungsten carbide teeth means long life and only requires easy touch up maintenance with a diamond lap stone file.